The list of tables of contents (TOCs) are now available for February 2019. The TOCs are formatted to the style of its publication and offers not only links to the full issue, but also to the individual articles in IEEEXplore®. Upon receiving this SPS Newsletter issue alert notification, you will see a list of the available TOCs for SPS publications. If interested, simply visit the SPS Newsletter and view the TOC issue/articles of choice. 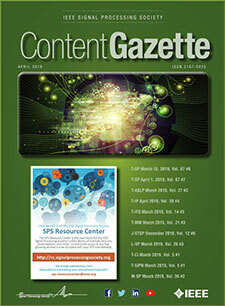 Each month, the SPS Newsletter will provide the latest TOC lists of linked issues and articles. As part of your membership benefit, the SPS Newsletter provides valuable and informative insights into many of the great events, conferences/publications updates, educational webinars from top SPS researchers, professionals, and thought-leaders, society news, initiatives and trends, chapters and distinguished lectures, and much, much more! We believe you’ll find this new feature to be an additional benefit of SPS membership! And regarding membership, remember that a new 2019 pricing incentive has been introduced: Students can Join SPS Now for $1 USD and enjoy all of the SPS Essential benefits of membership!